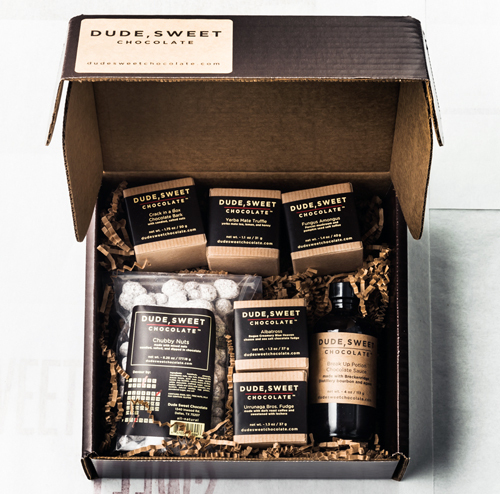 Valentine's Day is Friday and for those looking for a scrumptious and unique gift, one of my favorite go-to shops is Dude Sweet Chocolate in Austin. 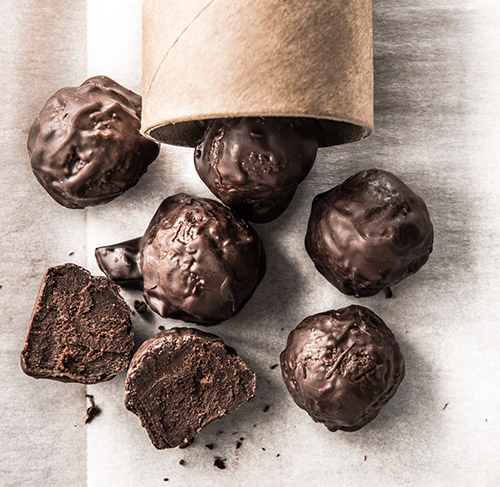 The Laphroaig Truffle is one of their most popular manly options, made with Laphroaig Scotch Whiskey, condensed milk, molasses and 73.5% dark chocolate. Any food item named Crack in a Box is a winner. 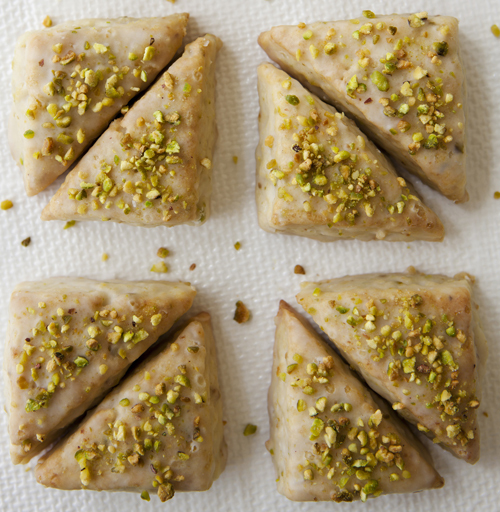 To make this ridiculously addictive concoction, whole hazelnuts, almonds, macadamia and soy are tossed in egg whites, powdered sugar and sea salt, then candied in the oven. A glob of 72% South American chocolate with raw cocoa nibs is added, then it's poured into slabs and cut. Stag Party Fudge is made with Jim Beam Red Stag Black Cherry Whiskey, walnuts and sea salt. And for the ultimate chocolate lover, send the Gift Box that includes chocolate truffles, toffee, fudge and potion plus Crack in a Box and Chubby Nuts. And it's just $35. Great deal... Click here to see all of the Dude Sweet Chocolate offerings which can be mailed quickly, via FedEx. Audrey Gatliff's baked-to-order shop all began during a trip to a local farmer's market where she saw big vats of oats for sale. They were inexpensive and full of culinary possibility. 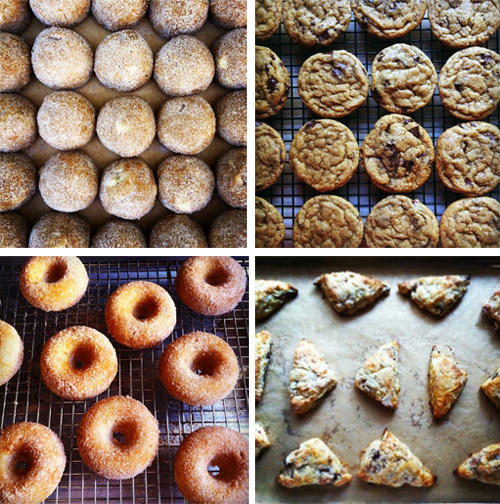 Audrey, "Oats can be breakfast for a whole week, plus they smell wonderful when you bake them." Her subsequent granola mix, which includes raw honey, almonds and pumpkin seeds, was a quick hit among family and friends. So...the question became, What next? 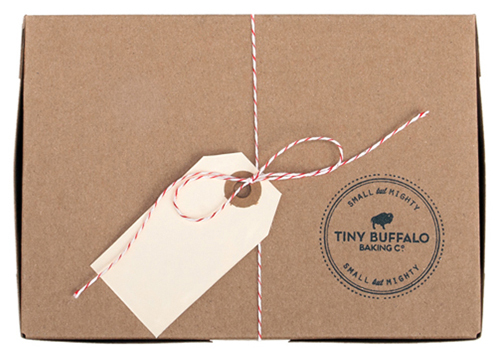 When I asked Audrey to describe her online based shop, Tiny Buffalo Baking Co., she replied, "It's a baking company that believes in little indulgences." 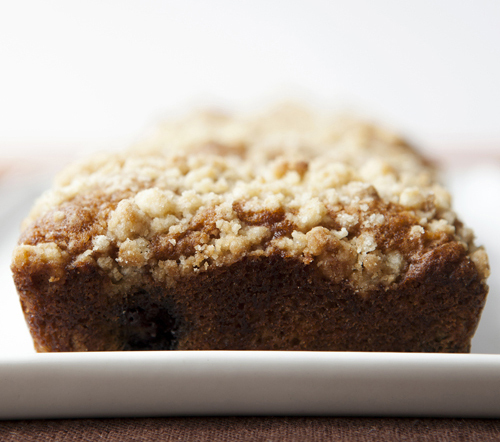 As she studied nutrition in college, she believes sweets can still be savored but in smaller portions - like these mini loafs (6 per order), which she offers in two flavors, Blueberry Crumb and Banana. Another little indulgence are her Petite Scones. Audrey admits the Pistachio Vanilla Bean is her favorite. She found inspiration at Starbucks when she tried their small vanilla bean scones that looked cute but tasted too sweet and dry. Audrey, "So I came home and started making a vanilla bean scone, then added pistacchio which made it better." 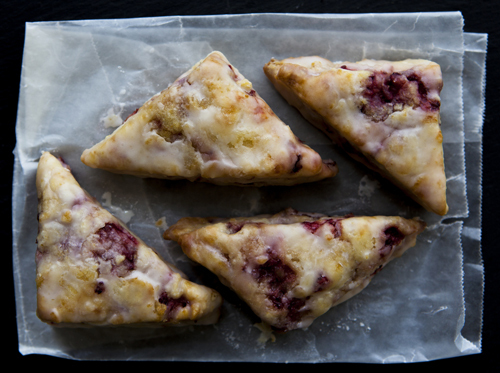 She prefers her scones to be more tender than crumbly. Good butter and keeping everything extra cold before baking helps her achieve the perfect tiny, tasty scone. 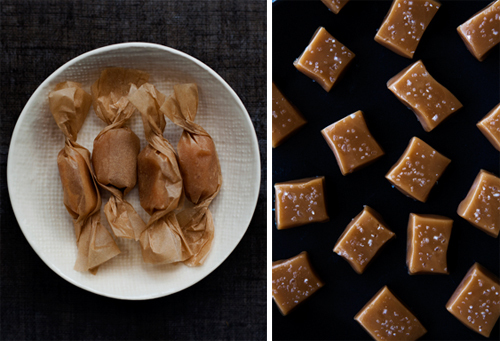 Audrey has tried her hand at candy too with her bite sized Sea Salted Caramels. This recipe took some time to get right as she had to find the exact right temperature to create the perfect chew. 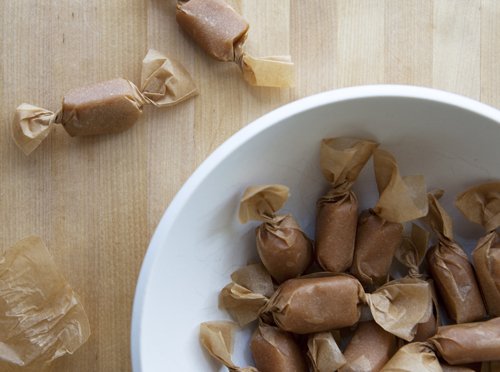 A lover of caramels, I think I need to try these. To expand her Tiny Buffalo Bake shop, Audrey added some pretty, functional aprons. She took the time to research the right maker and found it through Ashley Marie Meyer of Meyer Textile Company. Ashley handcrafts the rustic, utility style aprons on a small horse farm in Ellendale, Minnesota which felt like the right fit for Audrey- "These aprons have a nice thick canvas and are plain without too much going on." 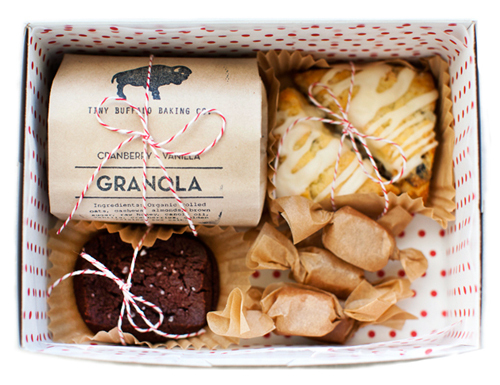 Tasty treats are one thing but stellar packaging is just as important in such a competitive field. 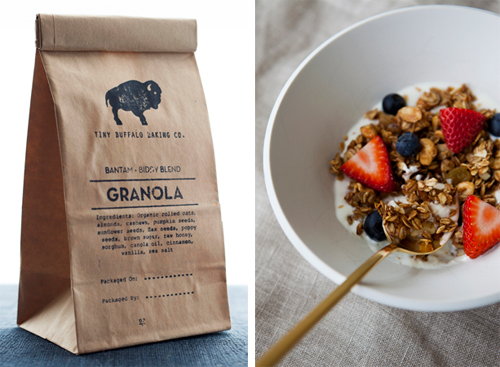 Lucky for Audrey, the natural, minimal design for Tiny Buffalo comes via her boyfriend and graphic designer, Dave Whitling and the talented Whitney Ott takes all the scrumptious photos. This year, Audrey hopes to be a part of more events and get the word out that her shop offers baked-to-order items and custom creations too. 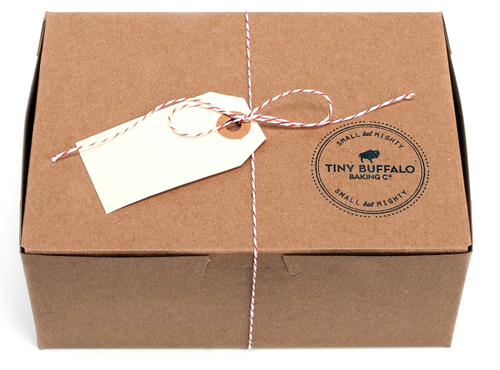 (She's based in Atlanta but can ship to your front door) When I asked Audrey how she came up with the name Tiny Buffalo, she shared how tiny refers to the smaller portions and buffalo refers to the natural world. "But mainly," she added, "its just fun to say."